For an industry that revolves around human relationships, is mobile technology the future? 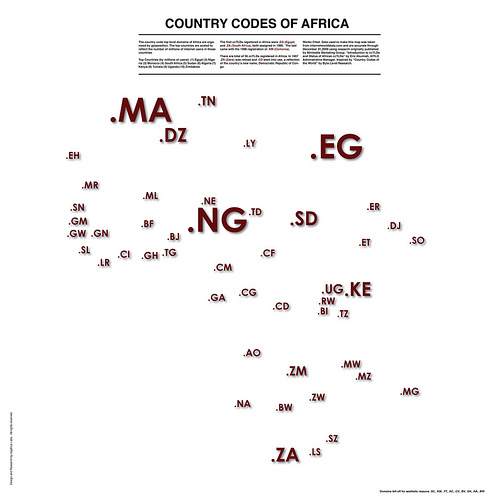 Africa’s ccTLDs. (Country code top level domains) On the map they’re scaled to represent the number of millions of internet users in each country. Other big players are Nigeria and Morocco, numbers 2 and 3 . Kenya and Uganda are also up there at numbers 7 and 9 respectively. But what about the others, as the map shows there are many of them. In June 2010, Ethiopia had 450 thousand internet users. Only 0.5% of the country’s population. In comparison, 33.4% of Moroccan people were using the internet in December 2009. Of course, these figures are changing all the time, and with constantly increasing speed. But huge disparities remain and the reality is that even in countries with higher stats, many people are living without internet. – Difficult for us to grasp, glued to our monitors, blogging and tweeting away. Connecting people is powerful. So in places that the internet can’t reach, projects like FrontlineSMS see mobile phones as having an important role to play. Enter your email address to receive news about my new posts by email.